The Beast – Bonzo – John Bonham of Led Zep found dead on this day in 1980 aged 32. In 24 hours he had 40 shots (1–1.4 litres) of 40% ABV vodka, after which he vomited and choked to death. Well, he would, wouldn’t he ? I will never forget a party where a shy young man drank a bottle of vodka and was really ill (I mean ill, not sick*) I thought that he was going to die and other people did, too. He was unconscious and some people took him to hospital. Who down-ticked poor Kitty in ‘general chat’? I can make a guess at this PDT. It should be a ‘down-tick free zone’. That would spoil the fun of the poor drone who does it; they probably don’t have much of a life. Well, it’s obvious that anyone who does it on General Chat is a bit er-um. Stream’s up a bit and dirty brown from overnight rain so can’t see my eels yet, but it’s going down and clearing. Weather forecast is for showers. There’s a light southerly and the skies to the south look pretty ominous – but it looks one of those days where the forecasters may be overly pessimistic; there are blue sky patches north and south too. Alex the new pooklet was taken further north downstream to a new sleeping nest beyond my view a few days ago, & seems to have disappeared back there with whanau again – but they’d all come up to the original pooklet nest for a while around 9 am this morning when 3 of them turned up asking for some breakfast cereal and toast bread. Alex is still growing really fast, Could only see it in the distance, but it was a lot bigger than a week ago and running around confidently, among the wild grasses, from pook to pook getting food and looks very fit and healthy, I’m happy to say. I could hear Alex peeping loudly, even with a slight southerly carrying the sound downstream. Mmm. That southerly’s getting a bit of a bite to it. I’m wrong above. Alex is still around the area of the original pooklet nest, with Sweety I think. Watched through binoculars as Aspen just took some bread there, and Alex came out from the bracken to have a little bit, then turned round and wombled back into a little tunnel – towards Sweety a little distance away. Just having fun by the look of it. Alex is quieter as a pooklet than Pickles and Jojo were: they were always peeping incessantly at their parents. Alex seems a lot more chilled out. It’s been showers on and off and a wind that meant that I have been chilled all day after being caught in a heavy shower that soaked me. It’s been 16o and I still haven’t thawed; I seemed to be cold all through. It’s brilliant sunshine a lot of the time then the skies open. We had hail this morning. 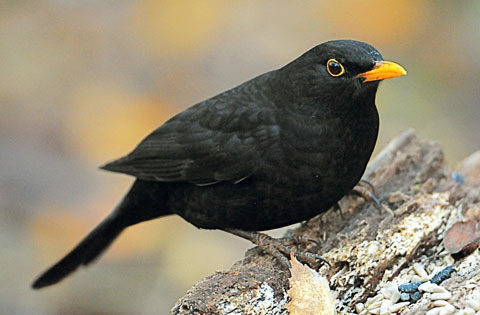 Blackbirds eat cat biscuits; I had some old ones that I put out on the offchance, and they just sat there until two blackbirds had a go and liked them. Interesting about the blackies and the cat biscuits. Fledgy and Hennie weren’t remotely interested in the little bread pieces I’d toss to the pooks after their cereal, although the sparrers would race them to it. But once I started giving it a quick dip in water, first Feldgy tried it and liked it, then, because he was going after it Hennie started chasing him – trying to get some – and now they both turn up at wet bread time and I’ve started breaking up very small chunks and throwing them some too. The boys definitely have the looks with the blackbirds. It takes a wee while to see the girl blackies’ charm. Their heads are quite a different shape. I like their yellow beaks. I used to use cat biscuits for dog treats but he went off them. The girls do have charm. It’s not as obvious as the boys’, but it’s there. I have seen birds dipping bread, but most don’t bother. They dip it in the drinking bowl, which does the water no good. Fledgy sometimes perches quite close on the fence lately. Their yellow eyes are striking as well. So is the iridescence. The girls look as if they’d feel soft and fluffy. Hennie is more on-edge than Fledgy. If I call his name & throw him his bread, he’ll watch & beat the sparrows to it. Hennie hasn’t got it yet – she’s learning, but she’s still inclined to run away in fright when the bread gets thrown towards her & the sparrows get it. In the supermarket today I saw a product with a prominent display – ice cream, Ben and Jerrys. Picked it up to look at, made in America, expensive. Just saw it advertised on tv. Good that we’re getting our essentials from the USA to help their trading situation and help the President deal to globalisation. Trying to boycott US goods until they exempt our steel. Our first ferret loved it and I used to use the end of the cone to make him a tiny icecream that he could hold in his wee paws. He was photographed more than once eating his liitle icecream cones.